/ Excalibur 3926TB Food Dehydrator: Why So Popular? Excalibur 3926TB Food Dehydrator: Why So Popular? What are you looking for in a dehydrator? excellent quality and great reputation with users. Does that sound like what you're looking for, too? Well, I did my research, and found all three requirements met in Excalibur dehydrators. I bought my first one in 2011, and have been enjoying it ever since. In this review, I'm going to give you the lowdown on the Excalibur 3926TB dehydrator. Excalibur makes a lot of different models, but the 3926TB is one of their best sellers. Why is it so popular? Because of all the reasons you're going to read about below. We'll talk about the features, pros and cons, price, warranty and more so that you can decide if this is the right dehydrator for you. Click here if you just want to go to Amazon to see what the price is and/or read the customer reviews. What are the features of the Excalibur 3926TB 9-tray dehydrator? How big is the Excalibur 3926TB? How many square feet of drying space does it have? How does the Excalibur work? Does it have a timer? What does the temperature on the dial indicate - air or food temperature? Where are Excalibur dehydrators made? Is the Excalibur 3926TB easy to clean? Can I buy solid sheets for the Excalibur? What can you use it for besides drying food? What are the pros and cons of the Excalibur 3926TB? What kind of warranty do you get? Where can I get a good price on a Excalibur 3926TB? Verdict: Should I buy an Excalibur 3926TB? Excalibur 3926T comes in black and white. 9 BPA free trays with BPA free mesh screen inserts. 15 square feet of drying space. Removable trays allow for maximum flexibility: make yogurt, raise bread dough, dry crafts, and more. 600 watts of drying power. 26 hour timer with auto shutoff. Removable door makes loading and cleaning a cinch. Choice of black (3926TB) or white (3926TW) finish. This dehydrator is 17" wide by 19" deep by 12-1/2" high. Yes, it's big, and it takes up a good bit of space. That's something to keep in mind if you're considering buying one. 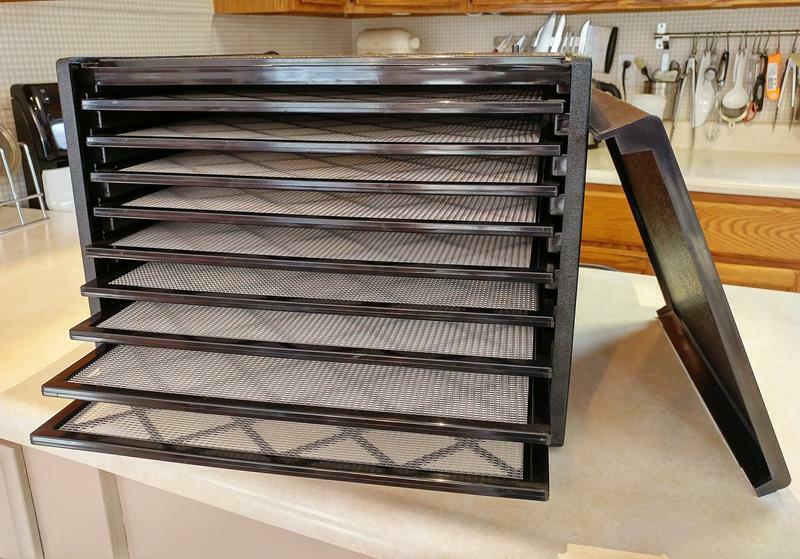 The 9 trays give you a total area of 15 square feet of drying space. 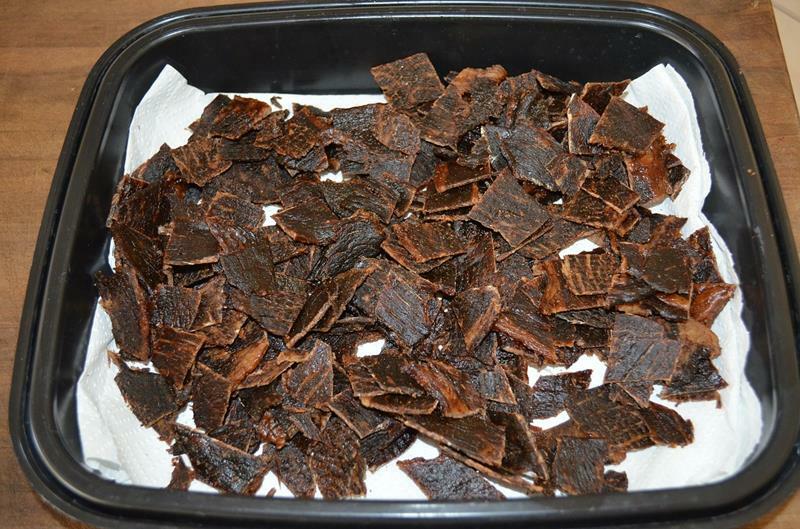 That allows for a whole lot of jerky or sliced apples or whatever it is you're dehydrating! This is my Excalibur dehydrator. It's similar the 3926TB, but without a timer, and it's an older model. In a nutshell, air is drawn in through the back of the dehydrator. The air is heated and distributed evenly across all the trays. The combination of heat and airflow causes the foods to dry. 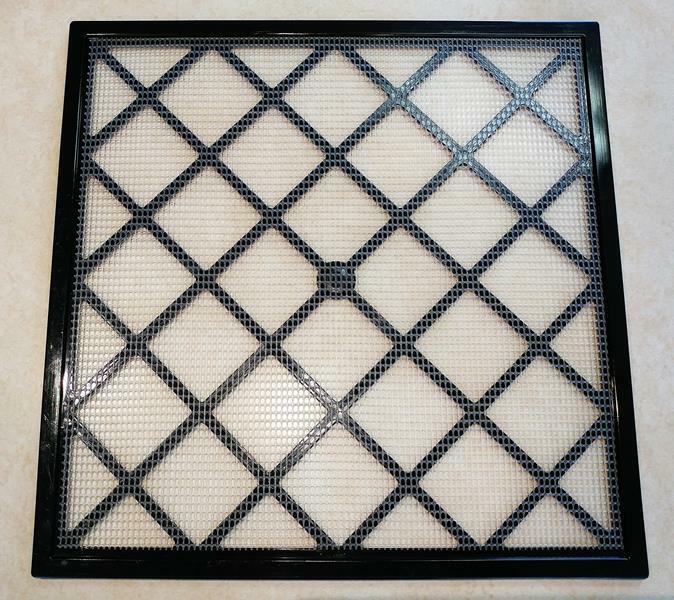 Excalibur calls their patented technology the Excalibur Parallex Horizontal Air Flow. It's exclusive to Excalibur and sets it apart from other brands. To use it, you lay out food on the drying trays and slide them into place inside the unit. Hang the door back on the front, and you're good to go. There are two dials on the top - one to set the temperature, and one to start the timer and turn it on. That's it. Load the trays, adjust the temperature, and turn the timer on. Because the air circulates so well, you don't need to rotate the trays. It has a timer which also serves as the on/off switch. Turn the dial to the number of hours you want, and it starts. When the time is up, it shuts off automatically. The timer goes all the way up to 26 hours, too! Now, I will tell you that you're paying an extra $35-$50 for the timer, depending on where you buy it. Whether it's worth that much is for you to decide. I have managed to get along without a timer, but I think if I had it to do over, I would fork over a few extra bucks for the convenience of having one. In case you're interested, the Excalibur model 3900B is identical to the 3926TB, but without a timer. You just turn the dial to the temperature you want, and it starts. You can check the current price and availability of the 3900B at Amazon by clicking here. The Excalibur 3926T has a temperature range of 105-165°F. This is a good wide range that allows you to dry a variety of foods. One thing you don't want to do is destroy the enzymes in fruits and vegetables by exposing them to temperatures that are too high. The lowest temperature settings on the 3926T ensure that the enzymes are preserved during the drying process. ​On the flip side, you need the temperature high enough to prevent the growth of bacteria when you're drying meat. This is something that I didn't understand until recently. I assumed that when I set the temperature on the dial, I was telling the dehydrator how hot I wanted the air inside to be - you know, like when you set the temperature for baking in your oven. When you set the temperature on the Excalibur for a certain temperature, you're actually setting the temperature at which the food itself is to be maintained. Normally, the temperature of food is about 20 degrees cooler than the air around it. That's because it has water in it. As the water evaporates, it cools the food. The Excalibur's thermostat makes constant adjustments to the air temperature in order to maintain a steady temperature in the food. This prevents enzymes from being destroyed while inhibiting the growth of bacteria and mold. That's why if you check the air temperature with a thermometer while you're dehydrating something, you might think the thermostat is defective. The air temperature could be as much as 20 degrees higher than the temperature setting on the dial. And that's okay because that's the way it's designed to work. Excalibur dehydrators are made in the USA - in Sacramento, California. They've been making them there since 1973. Yes, it's easy to clean. The plastic trays are dishwasher safe, but the mesh screen inserts need to be hand washed. I've found that the easiest way to clean the screens is to put them in the sink with hot soapy water and scrub with a dish brush. It doesn't take that much effort. To clean the inside of the box, take out the trays and then wipe it down with a damp cloth. You probably won't have to do that very often, unless you're making jerky or something else juicy. And I would recommend that you put a shallow pan or parchment paper in the bottom of the unit to catch the drips when you dehydrate juicy foods. It'll make cleanup a lot easier. 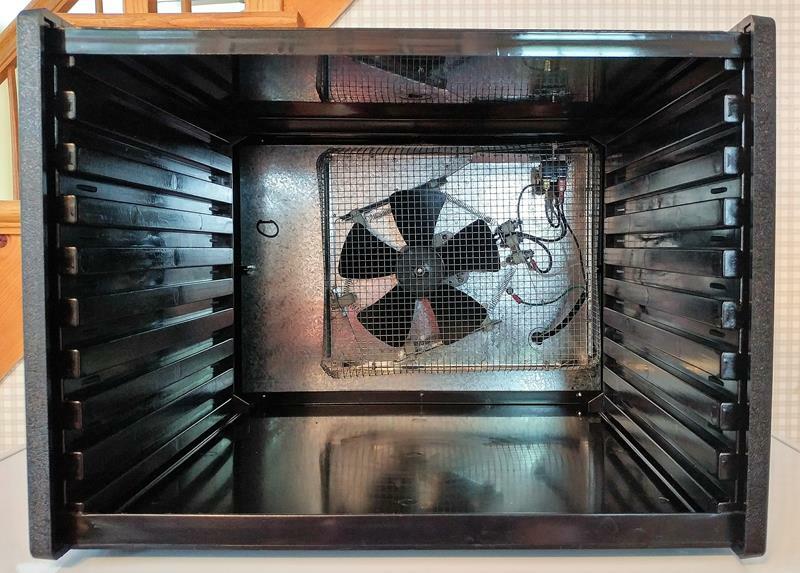 The good thing is that the fan and electronics are in the back of the unit, so you won't have juices dripping into those. Yes. The trays are made of BPA free food grade plastic, as are the mesh screens and solid drying sheets. The outer case is made of FDA approved food safe polycarbonate plastic. That means that it doesn't give off harmful fumes when it's warmed. Not all dehydrators are made of this type of plastic, so if you're considering other brands, be on the lookout for this. 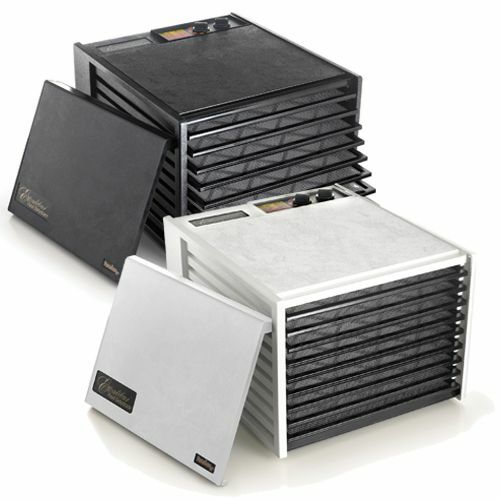 ​The sound the dehydrator's fan makes is similar to a microwave or a small portable fan set on high. It's not so loud that it interferes with conversation or makes it impossible to watch your favorite tv show. If you object to the sound, then you could put in an out of the way place, or let it run when you're not around. Thanks to the timer, you can do that. You get the dehydrator with 9 drying trays and a Guide to Dehydration book filled with all kinds of valuable information about dehydrating. The drying trays come mesh screens, but the solid fruit roll sheets are not included with the unit. Paraflexx Ultra Silicone Non Stick Drying Sheet - These are non-stick, odorless, and BPA free. You can also use them as baking sheet liners because they're made of silicon. Check the price at Amazon. ParaFlexx Premium Non Stick Drying Sheet - Also BPA, these are only for dehydrating, not baking. Check the price at Amazon. ParaFlexx Disposable Non Stick Drying Sheets - Made of parchment, use once and toss. Kind of a luxury, but they might be nice to have. Comes in a pack of 100 sheets. Check the price at Amazon. If you decide to buy solid sheets, make sure you get the correct size. The 3926T uses 14" X 14" sheets. The links above go to the correct size. There are some things that you can do with this dehydrator that you can't do with stackable type dehydrators like the Nesco Snackmaster Pro. Some people use it for drying flowers, drying crafts like salt dough sculpture, and making potpourri. 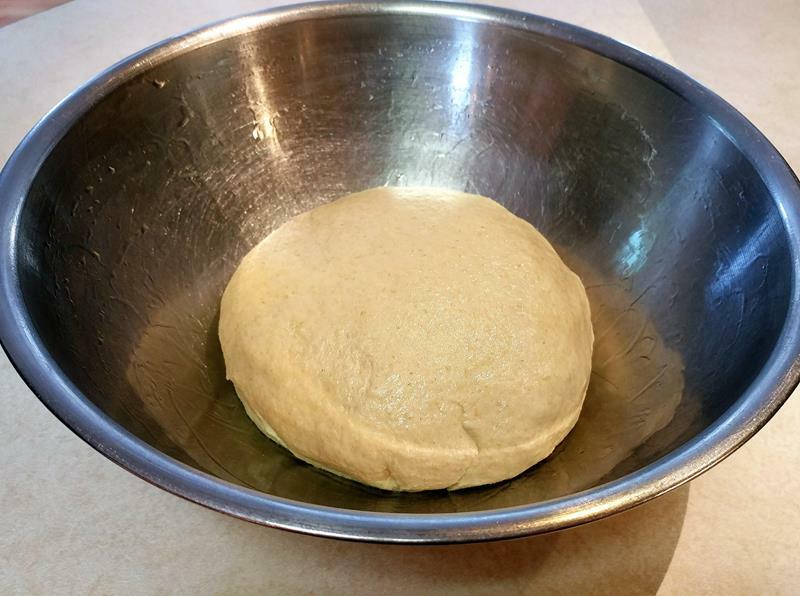 First, I made my usual bread dough, oiled it well, put it in a bowl, and covered it with a damp dish cloth. I took all the drying trays out of the dehydrator and put a shallow pan of water in the bottom. 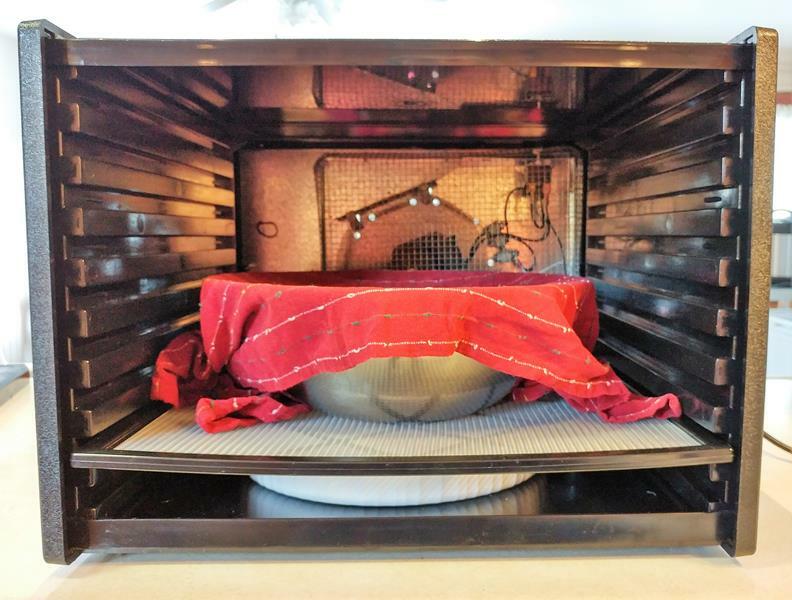 Next, I put a drying tray in the bottom slot to hold the bowl of dough and turned the temperature to 105°F to let it warm up for a couple of minutes. I put the cover back on the unit and let it go for about an hour, until the dough had doubled. Then I formed the loaves, oiled and covered them just like before, and put them back in the dehydrator for another 30 minutes. They came out perfect! I will always use my Excalibur for raising bread dough from now on. It's the perfect environment and so convenient! 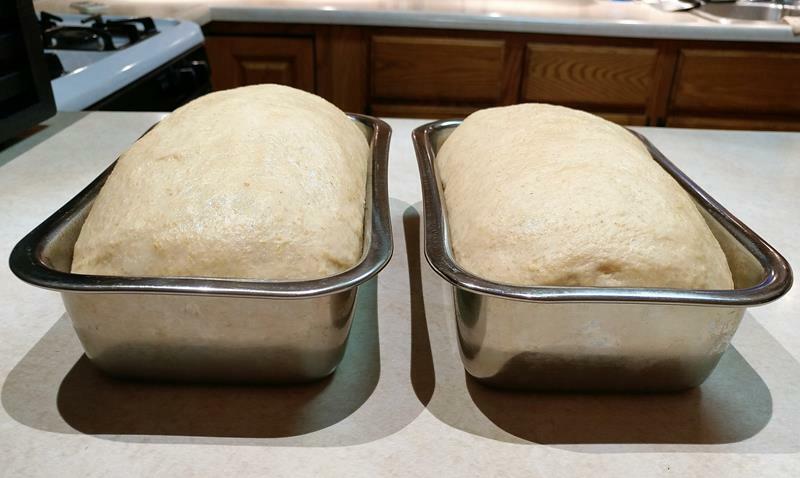 Because you have warm air circulating, it can dry the dough out if you're not careful. I checked halfway through the rising time and noticed that the cloth was getting dry, so I replaced it with another damp towel. If I hadn't done that, I think the dough would've had a dry crust on top. Accident averted! But anyway, all in all, I'm very pleased with how it turned out. By the way, instructions for yogurt and raising dough are included in the manual that comes with the unit. You'll find many other ideas and recipes in there as well. I have even heard of people drying lingerie in their Excalibur! I don't think you'll find that in the manual, but it's a clever idea! Excalibur has a great deal of confidence in their products. That's why they offer a 10 year warranty on the 3926T. I found the 3926TB at numerous online retailers at different prices. I suggest that you take a look around, and be sure to see if it's available at Amazon. Prices at Amazon can change at a moment's notice, so it's always best to go there and check the price. You can click here to check availability and the current price at Amazon. Let me make this easy for you. If you want a superior quality dehydrator with a large capacity that's going to last for years, then yes, you should buy one of these. Sure, it's more expensive than Nesco and Presto, but the Excalibur has so much more to offer. And this isn't the most expensive dehydrator you can get, either. In fact, it's affordable for most people, and it can save you a lot of money in the long run. Making your own healthy snacks and preserving food is going to help you cut your food budget. It also has a fantastic 10-year warranty, so there's basically no risk. The only downside is that it's big. If you truly don't have the space for it, then you might not be happy with it. But overall, I think you'd find that it's a great machine, and it's worth the extra money. 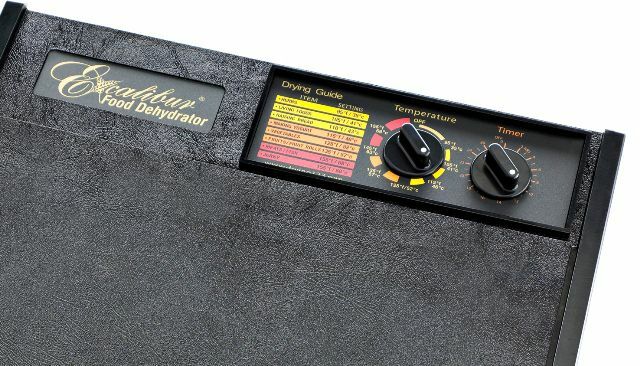 If the Excalibur 3926T sounds like the dehydrator for you, go order one today. 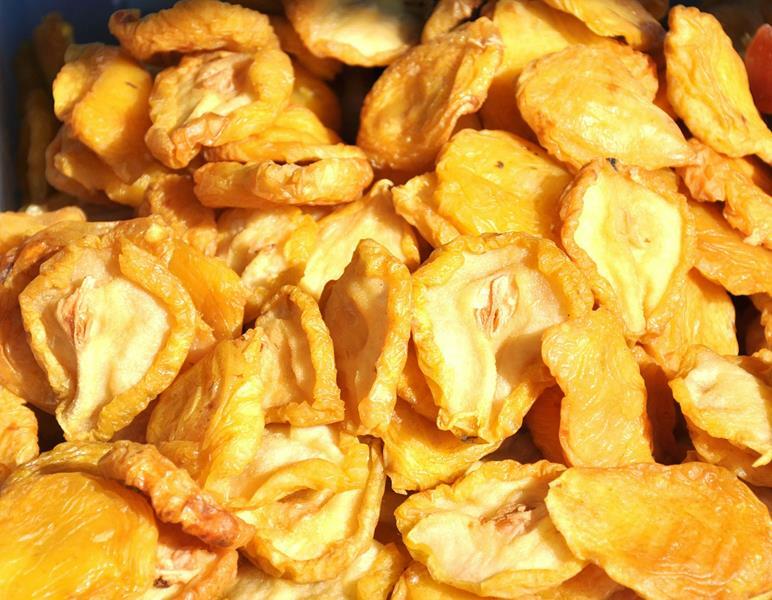 You could be dehydrating your own food next week! Click here to go to Amazon to check the current price and availability and read the reviews. For more information about how Excalibur compares to other popular dehydrators, please see my Best Food Dehydrators Buyers Guide.